Technically Spring isn’t here yet, but the fragrance from blossoms already perfumes the evening air. Daisy’s birthday is coming up and I am putting together everything for a small, but fun genie princess party, at the request of Her Royal Littleness. There will be cookies in the shape of magic lamps, homemade lollipops, delicate macarons, chocolate truffles wrapped in edible gold (Wish me luck with this one). Because she was born in the Year of the Rabbit and aptly during Spring, I can’t resist doing something special in that sense. There’s always a box of Pepperidge Farm’s puff pastry in my freezer, so there will also be Napoleons in the shape of Cream-filled Puff Pastry Carrots. EVERYbunny loves Napoleon. No, not the pint-sized powerhouse emperor of France. I’m talking about pastry, seemingly endless layers of paper-thin delicate buttery pastry held together with luscious vanilla custard. I did a test run of these “carrots” and they turned out gorgeous, just gorgeous. Pep Farm never disappoints. They went to the office with me where everyone called them cannolis and raved about how delicious they were. Busy moms like me love the fact that the ingredients list is short and all-natural. Even better is the fact that these things come together in a snap. See for yourself. I got some cone molds and wrapped strips of the puff pastry dough around the molds. You don’t really need the molds. You can easily shape some aluminum foil into cones and use them, instead. Do not wrap the strip of dough all the way up the neck of the cone mold. Leave some of the mold exposed at the top so it’s easier to remove the pastry horn once it’s cooled. Instant pudding is brilliant with the puff pastry and perfect for a busy mom. Use 2 1/2 cups milk instead of the full 3 in the package instructions. A more firm consistency will stay inside the puff pastry cone better. If you have the time, make the vanilla custard from scratch. Mom’s recipe is lovely and also quite easy. Find it here. Tip: Wrap the metal cone molds with parchment paper to prevent the pastry from sticking. Remove puff pastry from the freezer. It will need about 40 mins to thaw. Meanwhile, prepare the instant vanilla pudding with 2 1/2 cups of milk. Cover and store in the fridge. Unwrap a sheet of dough and cut into strips 1/2-inch wide. uncovered. This will make it easier to remove the pastry after it’s been baked. Set onto a nonstick cookie sheet and continue with the rest. 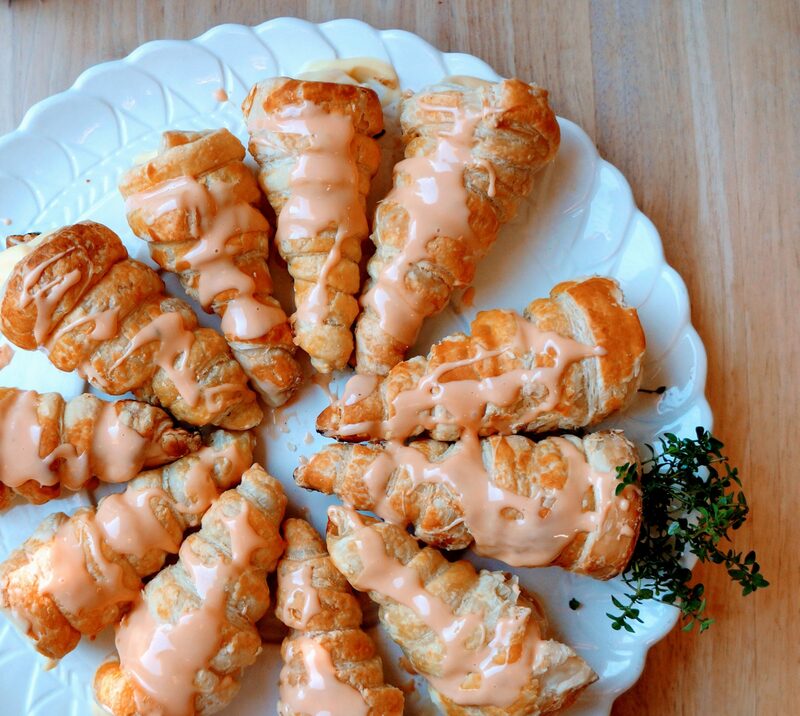 Brush top of pastry cones with carrot juice (optional). Transfer to hot oven and bake 15-20 mins, until brown. Mix a tablespoon of carrot juice with 4-5 tablespoons of powdered sugar. Remove from oven and wait 10 mins before removing the pastry from the molds. Once the pastry is completely cooled, fill with pudding and drizzle with icing, if desired. Use fresh thyme or mint to minic the carrot stem. This is the cutest idea! You are so clever and they look so delicious! Happy Birthday to Olivia!! !